Catherine Burchell has been canicrossing for over a year now…..but doesn’t own a dog! 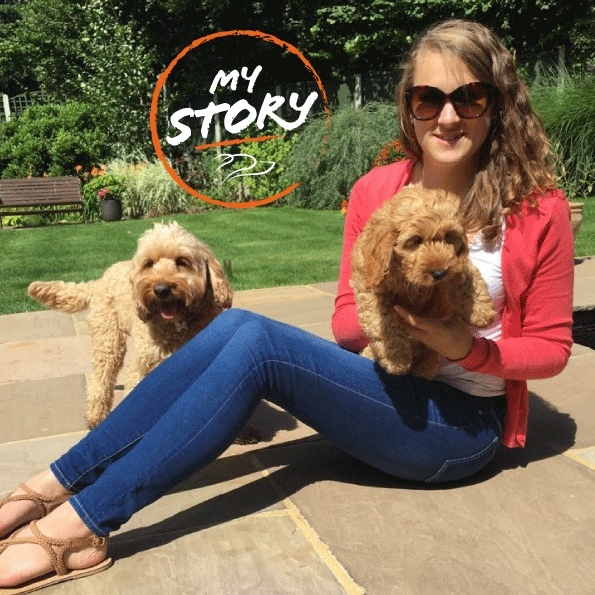 We interviewed her about her love for canicross and how borrowing her parents’ and friends’ dogs has now led to her and her husband taking the plunge and getting their own furry family member. But she’ll still be begging, stealing and borrowing her friends’ dogs for at least another year as new addition Stanley is only a few weeks old, Awwwww! New family addition Stanley checking out the trails he’ll be running one day! How and when did you first discover canicross? 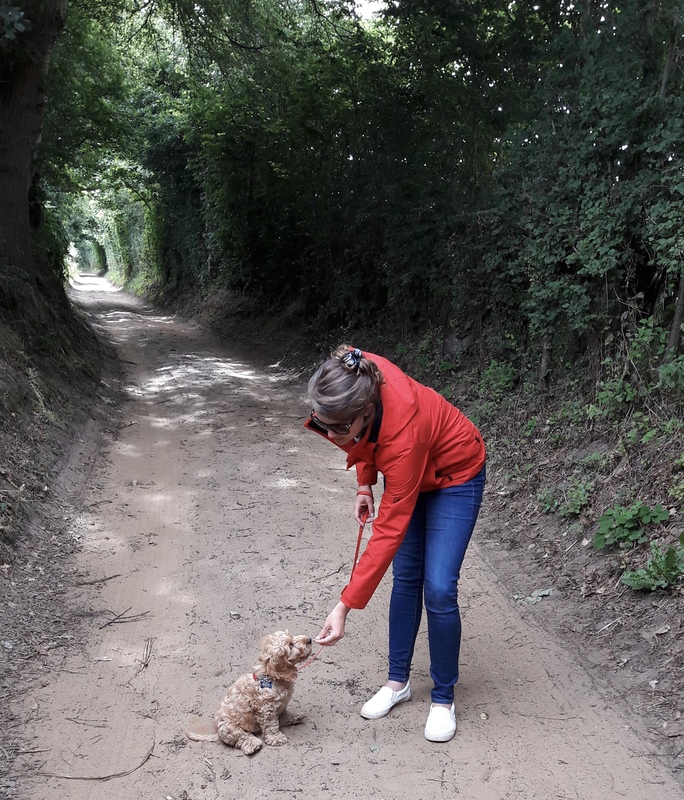 I started running off road with a village social group and every now and again I would take my parents’ dog, Murray, for a run around too. Knowing how much I enjoyed running and how much I loved spending time with Murray a lady in the group introduced me to canicross. I watched the Facebook page for months before being brave enough to go on one of the short social runs. Part of my reason for being so hesitant was that Murray isn’t really my dog, I didn’t always have him with me and I thought how can I take up canicross when I don’t really have a dog? 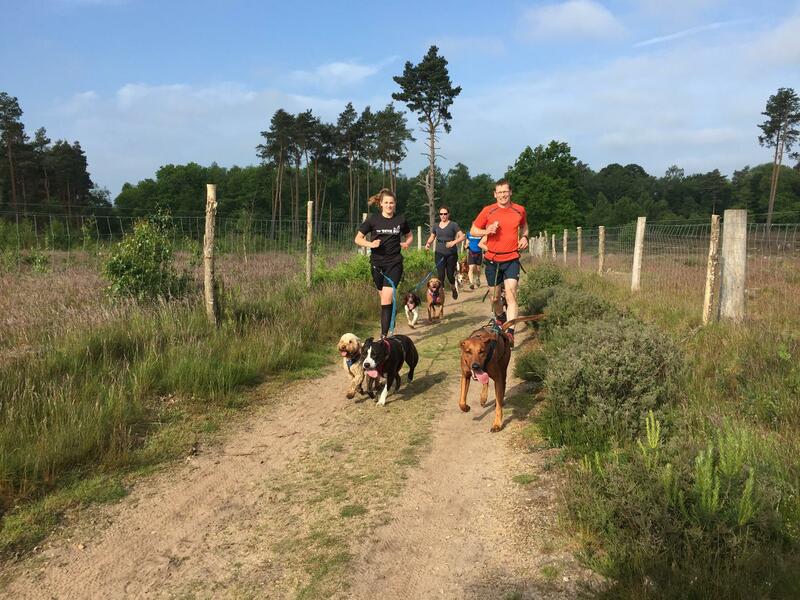 Can you remember your first canicross experience? How was it compared to running dogless? I vividly remember my first canicross experience. I turned up to that social run with no gear and no idea! I borrowed a waist belt, a bungee line and a lovely Staffie called Winston! Winston ran ahead of me pulling consistently, giving me a gentle ‘tug’ in the right direction. It was fantastic fun and I was hooked; this was ‘runners high’ but on another level. As soon as I got home I purchased kit for myself and Murray and we went out on canicross runs when we could. I loved it! It was more motivating than simply running with a group. We were both exercising so it was a great time saver, but it was much more than that. Murray enjoyed learning a new skill and began to respond to some basic commands. He was always keen to go out regardless of the weather and running attached to him made hills seem easier as I matched his pace on the steep climbs. How often and where do you run? At first I joined the runs that were 6/7 miles. I started running 3-4 times a week and I gradually increased my distance by joining runs that were a mile more than the last until before I knew it I could run 16 miles! I gradually increased Murray’s miles in the same way I increased my own. We are incredibly lucky to live in an area where the terrain is varied and we get some incredible views. Running on sandy, rocky, muddy, hilly trails keeps things interesting – no run feels the same and each one feels like a mini adventure. Canicross has made me a better trail runner and I have entered a couple of off road races without a dog but my favourite races so far have been the canicross races I’ve taken part in. 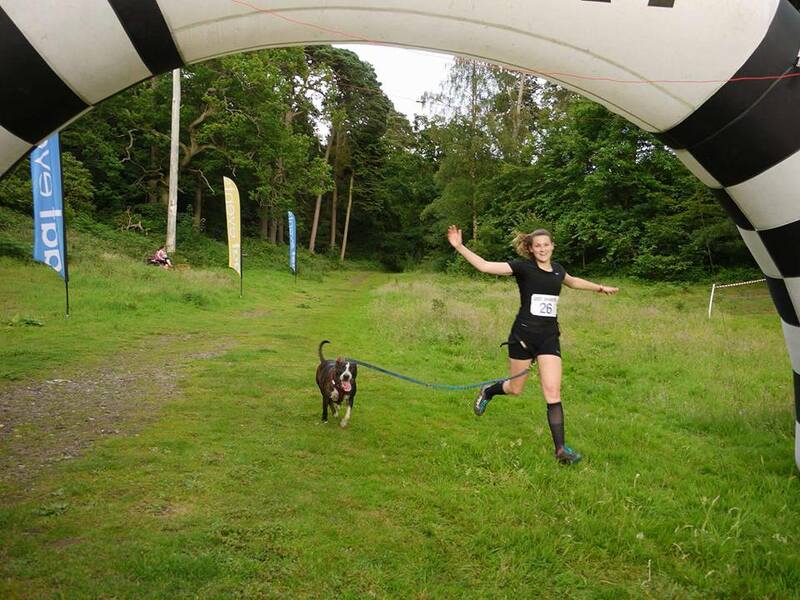 Murray and I did our first canicross race this year; the 8k Maverick Series at Polsten Lacey. It was a beautiful race on a sunny morning in May. Murray did me proud and was focused throughout. I also took part in the Hard as Snails 10k with my friend’s dog Sid. He was a great help on the hills, and there were plenty of them! This was a challenging run but so much fun, stunning views and exhilarating downhill sections through the woods. Catherine with Sidney, aka Super Sid, completing their local Hard As Snails 10k race! How big a part does canicross play in your life? Canicross is now a massive part of my life. I look forward to runs, I love spending time with the dogs, I have met so many people and have made some really special friends who are supportive and inspiring. It has had such a positive impact on my mental health, it’s my therapy. And although borrowing dogs to run with is brilliant and I am forever grateful to people for sharing their beloved pets I desperately wanted a dog of my own. 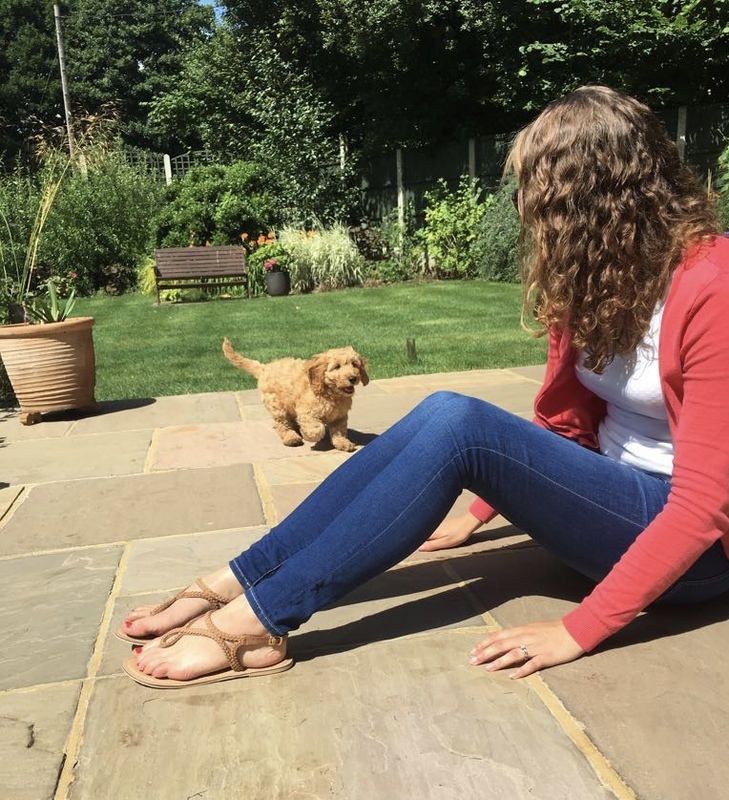 So my husband and I finally made the decision to get our own dog – this summer we got a puppy called Stanley. So tell us about your new pup? Stanley is a Cocker Spaniel X Miniature Poodle. He is destined to be my canicross partner and I hope that when he is old enough he can run alongside the dogs I currently run with. He’s already such a little character and I feel that I will learn just as much from him as he will from me! If you could sum up your canicross experience in one sentence what would it be? What would you say to someone who has never done canicross before but is thinking about taking the plunge? Give it a go, everyone starts somewhere! It’s so much fun and a fantastic way for you and your dog to get fitter together.